We are your sugarbuns, your butter....babies. Come for the trailer for Kiss the Girls 2: The Butterfly Collector. Brayton takes a look at the most common species of bassist, the prolific "Bald Shirtless Bassist with Goatee." That's right, it's time again for our annual tradition, our yearly ritual, our yuletide dipshittery. It's time, for Must Be Santa. Then a break to recharge our batteries! We'll be back in a month or so. Hi! 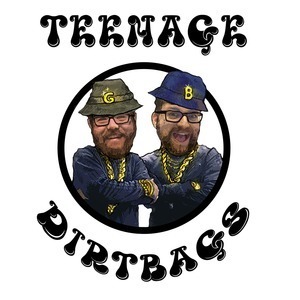 The Dirtboys are back talking about Gary's favorite hip hop group for the first time (but definitely not the last). There's a sassy owl. In a sort of anti Scatman John situation, a jackass frontman makes a decent song a bit worse rather than the other way around. 3 more episodes this season! Gary hasn't seen this one, so watch at your own risk. We'll be back with a regular episode next time! Summer Jam Seasons begins with THE WORST SONG WE'VE DONE FOR THE SHOW. (Extremely Warcraft 3 voice) The Slumlord...has awakened.